Doors open at 7. Show starts promptly at 8 p.m.
Come One! Come All! To the 4th Annual Carnival Ball! 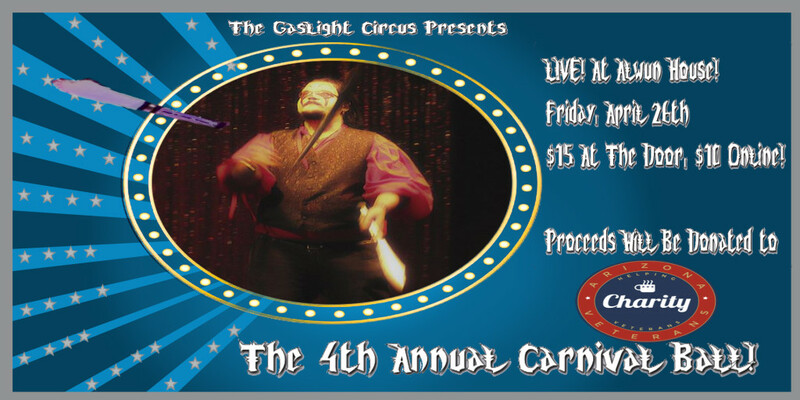 It’s that time of year again where The GasLight Circus comes together in support of local charity Arizona Veterans Helping Veterans as we put on a show unlike any other just for YOU! You’ll see all your favorite GLC Performers including “The Clown Prince of Arizona” Jero the Jester! GLC Clowns Rubix, Jack, and Talento! The Firey Fury of Techie Hilliker! And many more! The night’s festivities will also include the return of the GLC Carnival! 5 carnival games spread throughout the patio gardens for your entertainment! Tickets available online via Eventbrite, as well as at the door day of show!